A ground robot called Testudo. The camera on the robot is controlled by a touch screen, while an X-box controller controls the movement. The robot could be used as a scout for troops. So it can go around corners or into a room and have a look around, to make sure there are no surprises for the troops when they get there. And because it’s small and agile, it can get places where bigger machines (or people) can’t go. The Ministry of Defence has released pictures of new technology it is developing, or hopes to develop. 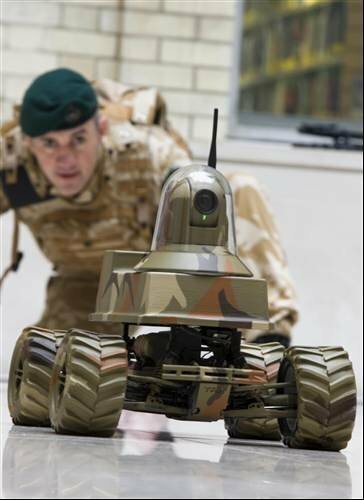 The images were released alongside the Defence Technology Plan, which sets out the MoD’s long-term research needs. It aims to encourage tech companies and academics to come up with the next generation of flying, spying robots and new lightweight tanks. Quentin Davies, minister for defence equipment and support, said exploit new technologies is "vital" for battlefield success.